The Payment Methods is one of the most important things you will need to consider when building your Online Store. Providing your customers with large variety of payment methods will ensure the customer satisfaction from your Store and also will remove the probability of a customer being lost because the lack of the requested by the same customer payment method. In the next few lines of this tutorial we will show you how to configure the basic payment methods provided by WooCommerce. Now that you have configured all the options related to the Checkout process your customers will be performing it is time to actually configure the payment methods on your website. On the same page where you were configuring the Checkout options you will be able to locate the Payment Gateways section. 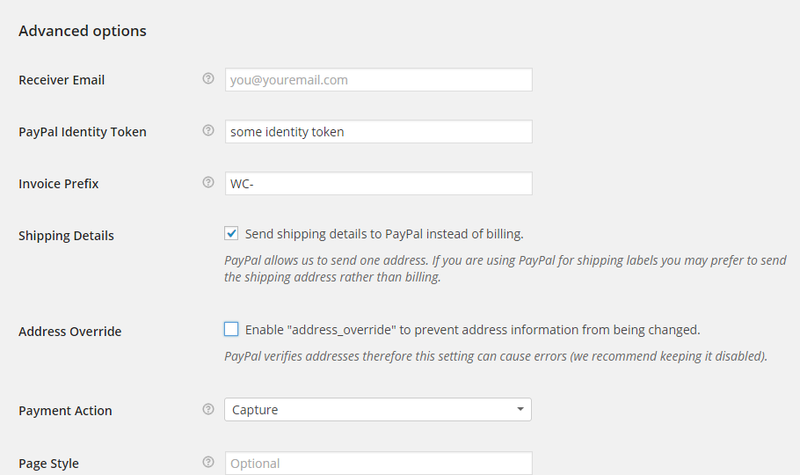 As mentioned previously in our WooCommerce tutorial series the section contains the supported by default payment methods. 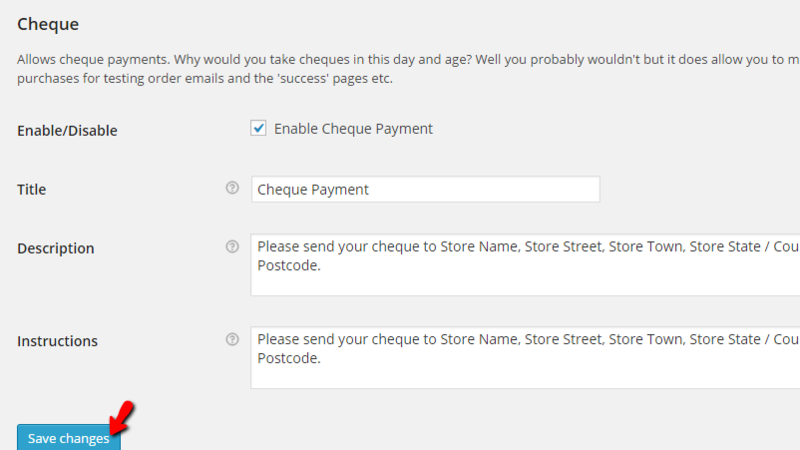 By clicking on the Settings button you will be able to configure the settings for each payment method independently. Let us start with the Direct Bank Transfer method. This method is used when you would like the payment for your products to be directly processed via a bank/wire transfer. The options you will need to configure for this payment method are few and they are quite intuitive – Description, Introduction and Account Details, while the last one is actually used to add bank accounts you would like the transfer to be pointed at. Once you are done with all the changes please click on the Save changes button so all the performed configuration can be saved and you are done. The next payment method is called Cheque and as the name suggests it is used for allowing your customers to pay with an E-Cheque. The options you have to configure here are also relatively simple – Title, Description and Introduction. Once you are done with these please click on the Save Changes button so all settings can be saved. The next default payment method is called Cash on delivery and as the name suggests it is used when you would like to enable your customers to pay whenever they receive the product. When you are done with these configurations, please use the Save Changes button so all these changes can be saved and you are ready to receive payments upon delivery. The final default payment method is called PayPal and most probably this is the one you would like to ensure that is checked. The configurations available for this payment method are quite a lot and we will review those separately by the sections they are into. First let’s begin with the PayPal section itself. 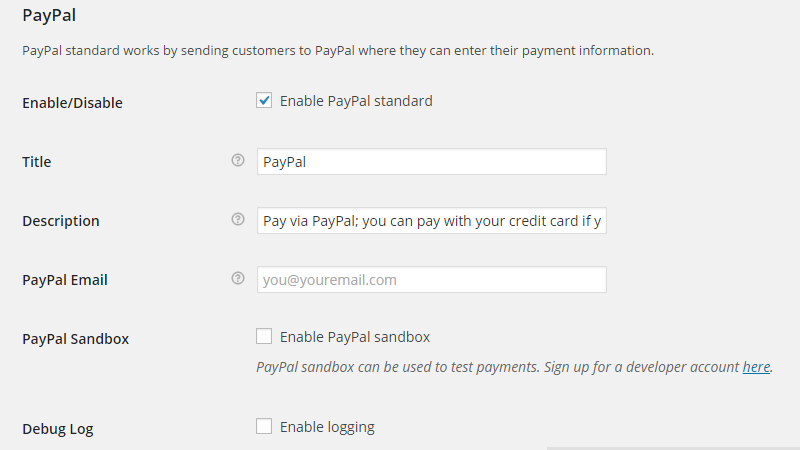 It contains the basic information as the other options does, however with the addition of the PayPal Email, PayPal Sandbox and Debug Log options. These are used respectively for defying your Paypal email account, if the shop should be in sandbox mode and also if the payment method should create a debug log at the mentioned location. Once you are done with these settings you should move forward to the last section of settings which is called API Credentials and there you will need to fill your API Username, Password and Signiture in order for you to be able to process refunds. You should be able to find more information on generating these credentials in the official documentation for PayPal developers. Once you are done with all the settings please use the Save Changes button and you will finalize the setting of this Payment Method. Congratulations! You now know how to configure all of the default Payment Methods on your WooCommerce based Online Store!